Àdàkọ:Contains Arabic text Abdullah bin Abdulaziz al Saud, Custodian of the Two Holy Mosques, (Lárúbáwá: عبد الله بن عبد العزيز آل سعود‎ ‘Abd ullāh ibn ‘Abd al-‘Azīz Āl Su‘ūd) (born August 1, 1924) is the King of Saudi Arabia. 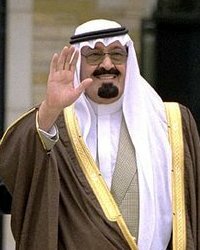 He succeeded to the throne on August 1, 2005 upon the death of his half-brother, King Fahd. ↑ "King Abdullah: A Who2 Profile". Who2.com. August 1, 2005. Retrieved October 23, 2011. Àtunṣe ojúewé yi gbẹ̀yìn wáyé ni ọjọ́ 11 Oṣù Kẹta 2013, ni ago 11:35.